Stability: Have you been around a long time or have you just arrived on the scene? Are you seen as a ‘fly-by-night’? Development: In fast changing times, do you have a future? Are you keeping up-to-date with the latest trends or research? Vision: Are you just out for yourself or do you have a bigger aim? What are your values? Competency: Are realistically able to deliver what you promise and deliver on your vision? Relationship: How do you treat people? How do you make them feel? Benefit: What do we get out of trusting this person or organisation? How do we benefit? 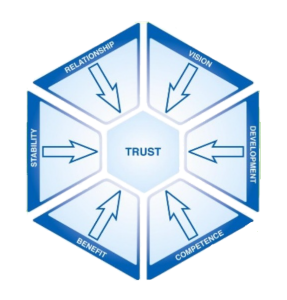 Statistically, these six facets of trust have been shown to drive over 70% of trust. Trust is highly correlated to satisfaction and propensity to recommend, driving your internal Net Promoter Score (NPS). HuTrust® has been applied to top organisations from airlines to yogurt, from Australia to Qatar, yielding measurable and positive outcomes. In 2012 alone, over 1,000 people were trained to use HuTrust® to improve their business performance. Some participants noted almost instant positive returns. As a certified HuTrust® partner, Mike Lowe offers combined mentoring and training packages for leaders wanting to raise the level of trust in their teams. A minimum of five one-hour mentoring sessions is required to begin to become proficient with the model and to apply it in the workplace, raising productivity, creativity and fun. 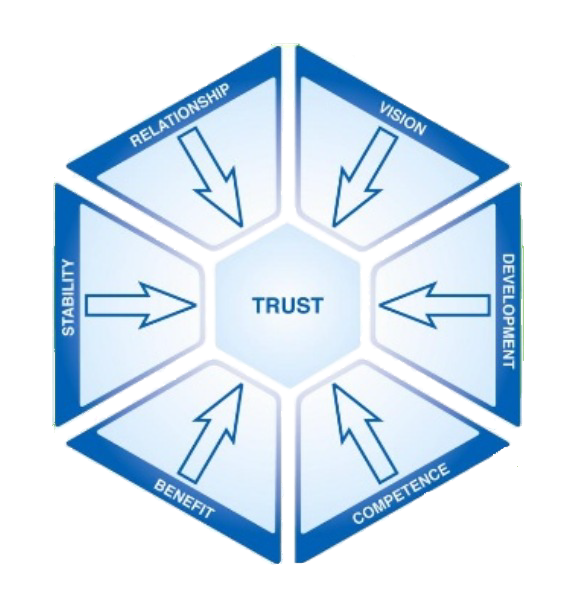 Individual sessions can be combined with group sessions to rapidly build trust and trust-competency in teams. In cases where there is considerable mistrust and/or conflict within the team, more sessions may be required. The package combines HuTrust® with Talent Dynamics™ to enable a greater appreciation of the diverse strengths within a team. See more ….